Cut zucchini in half lengthwise. Cut a thin slice off the bottoms so each half sits flat. Scoop out the pulp, leaving a ¼-inch shell (discard the pulp). Brush the cut sides with oil and sprinkle with salt and pepper. Combine ricotta, garlic and parsley in a small bowl. Combine sausage, tomatoes and Italian seasoning in a medium bowl. Spread about 2 tablespoons of the ricotta mixture in each zucchini half. Top with equal portions of the sausage mixture. 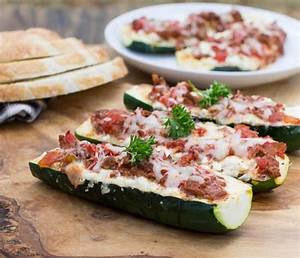 Place the zucchini boats in a 9-by-13-inch baking pan and cover with foil. Bake for 25 minutes. Remove the foil and sprinkle the zucchini with Parmesan. Bake, uncovered, until the cheese is melted and starting to brown, about 5 minutes more.